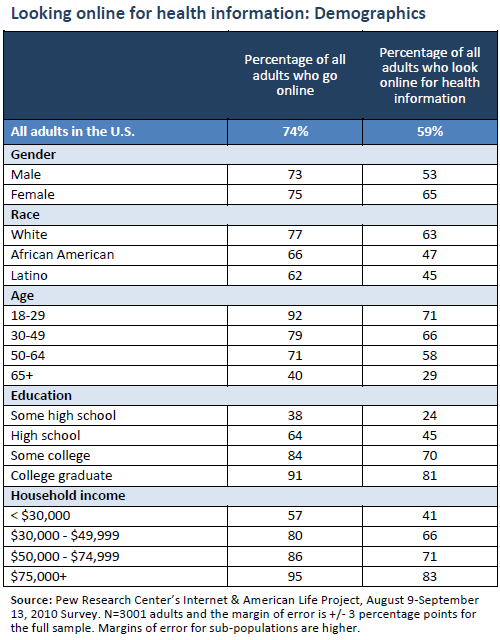 59% of all adults in the U.S. look for health information online. Internet access drives information access. Since one-quarter of adults do not go online, the percentage of health seekers is lower among the total population: 59% of adults in the U.S. look online for health information. Women, non-Hispanic whites, younger adults, and those with higher levels of education and income are more likely than other demographic groups to gather health information online. There are two forces at play in the data: access to the internet and interest in health information. For example, women and men are equally likely to have access to the internet, but women are more likely than men to report gathering health information online, which explains the gender gap in the chart below. For the other groups, the rate of internet adoption combined with their level of interest in health information drives their numbers either up or down. This is particularly true when it comes to education: only 38% of adults with less than a high school education go online, compared with 93% of adults with a college degree. Once online, 62% of internet users who have not graduated from high school say they gather health information online, compared with 89% of internet users with a college degree. The result is a significant gap in information access: just one in four adults who lack high school diplomas gather health information online, compared with eight in ten college graduates. 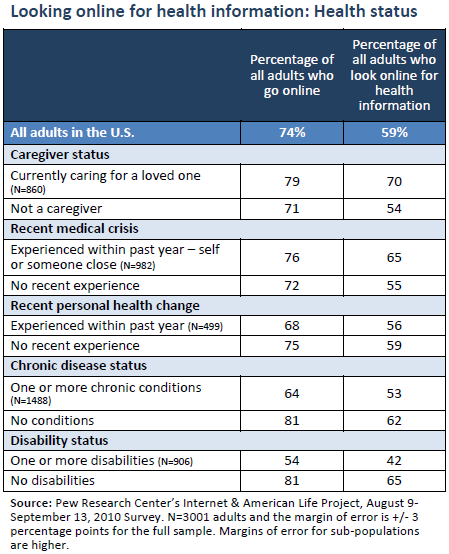 Adults who, in the past 12 months, have provided unpaid care for a loved one are among the most likely people to have looked online for health information of all kinds (see table below). Caregivers are not only often in need of health information but have the means to obtain it online: eight in ten have access to the internet. Interestingly, a third group – people who have experienced any other significant change in their physical health in the past year, such as gaining or losing a lot of weight, becoming pregnant, or quitting smoking – do not report a higher rate of health information seeking compared with other people. As the Pew Internet Project and the California HealthCare Foundation have reported in the past, people who are living with chronic disease or disability are likely, if they have internet access, to be highly interested in online health information. For those two groups, it is their lack of access to the internet which holds them back from parity with people who report no chronic conditions. The typical search for health information is on behalf of someone else. Half of internet users (48%) who go online for health information say their last search was on behalf of another person, 36% say their last search was on behalf of themselves, and 11% say it was both for themselves and someone else. Thus, while eight in ten internet users go online for health information, the impact of their inquiries may be much broader. Caregivers are the most likely group to say they were thinking of someone else during their last search: 53%, compared with 45% of internet users who are not currently caring for a loved one. Online parents with young children living at home are another group likely to say their last health information query was on behalf of someone else: 56%, compared with 43% of internet users who do not have children under 18 living at home. 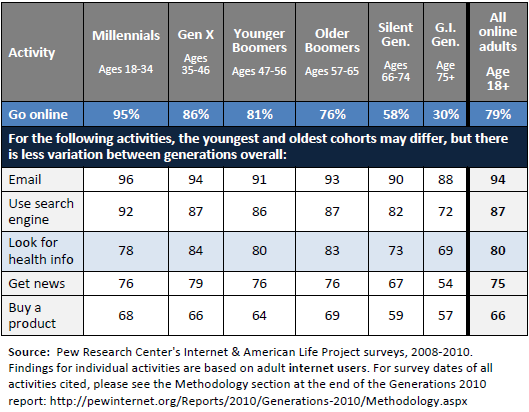 Internet users ages 30-49 are the most likely age group to be focused on other people, which is not surprising since two-thirds of this group have young children living at home and may also be looking for information on behalf of aging relatives. Fifty-five percent of internet users in their 30s and 40s say their last search was on someone else’s behalf, compared with 42% of internet users ages 18-29, 46% of internet users ages 50-64, and 36% of internet users ages 65 and older.